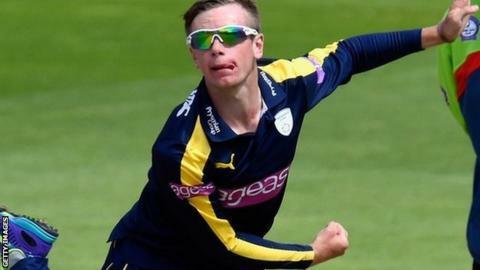 Former England bowler Steve Harmison has tipped Hampshire leg-spinner Mason Crane to be picked for England's series away to Pakistan this winter. The 18-year-old, already capped by England U19s, has taken 10 wickets in two first-class matches this summer. "I think England have got to give serious consideration to taking Mason Crane to the UAE (United Arab Emirates) as third spinner," said Harmison. "I've seen a lot of him in Twenty20 cricket and he's a really good player." Crane, in his debut season for Hampshire, took 5-35 against Warwickshire in the County Championship last week. He has taken 10 wickets in six One-Day Cup matches and returned figures of 3-97 across his three T20 appearances. Former England spinner Phil Tufnell also believes there could be several new faces on the United Arab Emirates tour. "They are completely different conditions in the UAE and they will have to adapt," he told BBC Radio 5 live. "You feel that the top order is slightly fragile and they'll be looking for one or two players to come in, or at least knock on the door. "I'm looking forward to seeing (England one-day spinner) Adil Rashid get a Test match in the UAE. I don't think Moeen (Ali) bowled very well this summer and it's going to be interesting to see if he's up to the task."